Halloween Fun at Edaville Family Amusement Park! When I was a kid my sister, brother and I waited all year long until my parents finally said we were going to “Edaville Railroad” to see the Christmas lights. I’m dead serious – it was one of the highlights of my childhood and I have so many fond memories of going there year after year with my family. These days it’s know as Edaville Family Theme Park and I am so thankful that I have the chance to go there with my own children so they can have the same wonderful memories of Edaville as I do. 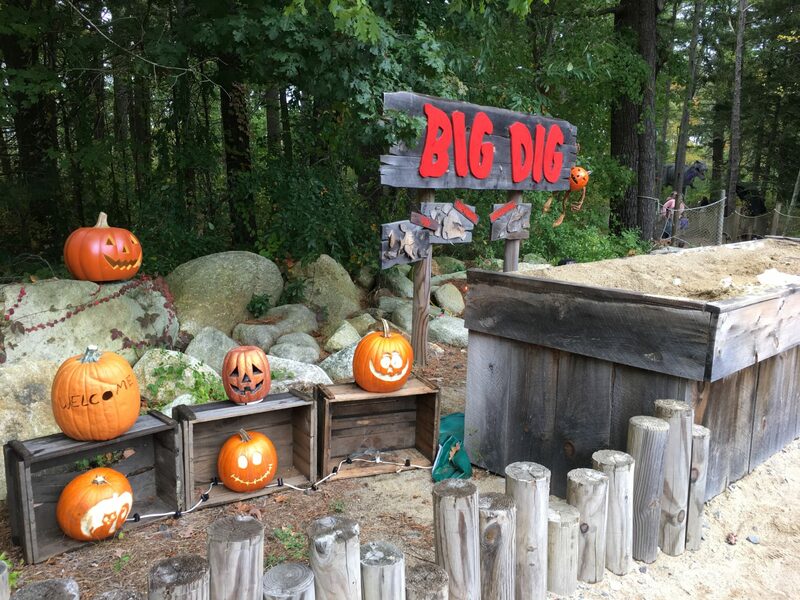 Edaville Family Theme Park is tucked away in the middle of cranberry country in Carver, MA. It is a fun family attraction which features amusement rides including a Ferris Wheel, carousel my boys favorite: the bumper cars! Each admission includes a five mile train ride through the cranberry bogs on their property, all the rides, Dino Land and Thomas Land. My family had a chance to go to their first annual Not So Spooky Halloween event this past weekend. Not So Spooky Halloween is a fun event featuring big kid rides, little kid rides, family rides and parent approved trick or treating at every ride! Guests are encouraged to dress up in their favorite costumes and head on over for a full day of family friendly FUN! Most of the Halloween decorations are set up over in Dino Land and they did a really good job with them. 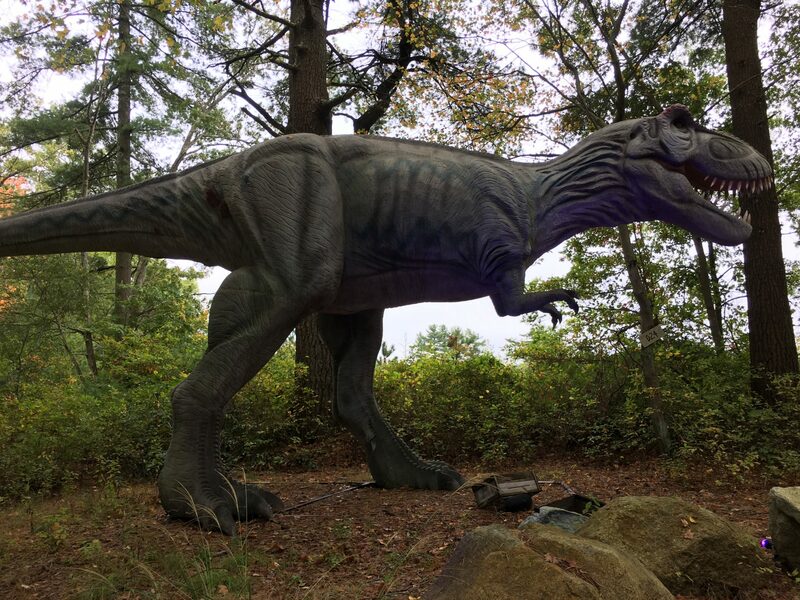 As you walk along the path, you will not only see all of your favorite dinosaurs, but some pretty cool Halloween displays including all kinds of non-spooky pumpkins, skeletons, monsters and more. Not So Spooky Halloween is being held every Friday, Saturday and Sunday until Sun Oct 29, 2017 and the park is open from 10-8 on those days. If you have time this October, head on over and check out Edaville’s Not So Spooky Halloween. It’s a fun way to spend a day with the family and as always, admission to Edaville Family Theme Park includes Thomas Land, Dino Land, all rides & attractions. Oh, and just a little fun fact. Massachusetts is one of 5 states that grows cranberries. The other 4 are Wisconsin, Oregon, Washington and New Jersey. Edaville Family Theme Park is located at 5 Pine Street in Carver, MA! Edaville looks like a lot of fun. My family loves amusement parks. I’d love to take the kids there for some good times. I love these mom-and-pop places! They are so much more fun and so much more personal. We have a couple places like this out here and we go to them as much as we can. I love places like this. What a fun family day. Edaville Family Theme Park looks like so much fun. I would love to go with the kids and explore. That looks like a lot of fun. I love amusement parks. They’re always better during Halloween too! The Halloween decorations they added were really cute. I like when amusement parks take the time to make things fun for Halloween! These types of places like Edaville Family Theme Park make some of the best family memories. I love that there is a 5 mile train ride also. Sounds like fun! I love all the festive pumpkins … such cute decor everywhere! I have never heard of this place before but it sounds so awesome. What a great experience for the family! My kids have not been this year. We need to make a trip there soon. Cheers for Halloween fun! Looks like so much fun and I love all the decorations. I love Halloween! This looks like so much fun! We love finding fall festivals and pumpkin patches to visit as a family and take photos. This place looks like so much fun! I sure which I lived by this. We do have some nice places in my area that we are going to check out this weekend. Looks like a super fun experience for the whole family! I love how it’s not so spooky! The older I get I’m so turned off by scary Halloween stuff. Oh this is so great! I love how everything is Halloween themed, but not overly spooky so the kids get scared. Looks like there’s so much fun in here! Would love to visit! It looks like y’all had a blast. I love theme parks, especially when they are all decorated for different Holidays. We will be going to the Mickey’s Christmas party this year so I am super excited about that. I love places like this! My daughter and I always have fun exploring amusement parks. This one looks like a blast! Local family amusement parks are so fun. Such a great place to make long-lasting family memories. Edaville Family Amusement Park came up with some cute Halloween touches, too – those glowing dinosaur eyes are great. Love family friendly not so scary Halloween events. It’s nice to have events the entire family can enjoy together. This is such a great place to visit with the family! Amusement parks are always a hit, and Edaville seems to be no exception. What a fun way to celebrate fall! I am loving the bumper cars – my son would love it! We’re going to an amusement park on Saturday for some Halloween fun. Always a fun family outing when going to the local fun parks. Especially when they decorate for the holidays like they have done for Halloween. Halloween has become such an event and I kind of love it! There are Halloween themed events in PA that I want to check out; hopefully we have something as cool as this. This looks like a wonderful family adventure! What a great way to get away and for kids to use their imaginations. I love that there are a lot of ways to enjoy the park other than just rides! Looks like an incredibly good time. I used to take my kids to an amusement park every year when they were younger. Such a great way to build memories as there is always so much to do for everyone. We’re in the process of planning our first trip to Edaville Family Amusement Park because my little guy is anxious to visit Thomas Land. It’s great that they didn’t go overboard with the spooky Halloween decorations because that can really be a turn off for kids. Kudos to them for keeping family friendly for all ages. This looks like so much family fun – I didn’t know that about cranberries either thanks for sharing that knowledge. Wow this looks like so much fun! I love amusement parks and more when they make it with a Halloween theme. Thanks fir sharing! This looks like so much fun for the whole family! I know my kids would really enjoy something like this. Edaville Family Amusement Park sounds like a lot of fun for the whole family. I love how it’s all decorated for Halloween. This looks like a lot of fun. There is an amusement park here that does a fright fest. I haven’t ever gone but I think I would like it better than going in the summer. Oh gosh!! I love a good theme park and this one looks like so much fun all decorated up for Halloween!! I hope you family had a great time!! I love anything Halloween, so count me in! I wish I could go and take the kiddos, that’s so fun. Edaville looks like a fun place to visit. I love all the fall decorations. It looks like a great time for a family of all ages and sizes. I love your family adventures. You guys are always off having a fantastic time. This looks like a great park! My kids will go crazy over the dinosaurs! I think it’s awesome to take the family here, so many thing to explore and experience! They’ll have fun for sure. I do not like being in a crowd around spooky things, but this is completely adorable and I think I would like it! This is the first I’ve heard of this place. It sounds AND looks like it’s a blast! I need to make a trip here with the kids! It isn’t too far away and it looks so cute! That looks like so much fun! Wow! I wish we had cool places like this in our area! I honestly think one of the best parts of parenthood and taking your children to do all of the things you loved as a child. I love seeing my kids get excited about the same things that excited me. This looks like such a fun place and a special memory. This looks like seriously, awesome family fun! I am definitely going to check this place out! Oh if we only lived close! This sure looks like fun place to take the family too. I would enjoy the bumper cars myself. That would be like reliving my childhood once again. That’s so nice that you’re able to visit somewhere you loved as a child with your own children. It looks like a fun place to visit and that Halloween event sounds great! this looks like a blast for the whole family. need to check if there is something similar close to us. This looks like a great time! My youngest is dinosaur obsessed and would love the skeletons! That really does look like a lot of fun. I haven’t done anything Halloween related yet this year. I need to change that! Edaville Family Amusement Park seems like it is a complete blast, especially at Halloween. I will have to stop by if I’m ever in the area. Oh my gosh, that looks like so much FUN! I love how they’ve done all the decorations! That looks like a lot of fun, we love the fun side of Halloween with younger kids. LOVE the spooky dinosaur skeleton. That is right up my alley. Looks like you had a wonderful time!